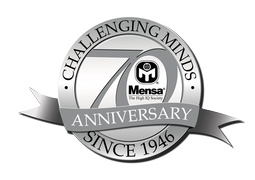 Mensa was founded in England in 1946 by Roland Berrill, an Australian lawyer, and Lancelot Ware, a British student who would later gain a series of credentials in science and law. They met by chance and talked on a train at Oxford, where they formed the idea of a society for bright people, where the one single qualification would be a minimum IQ. The name Mensa, appropriately, is a pun. Mensa -- Latin for "table" -- conveys the round-table idea of a society of equals, but also includes mens, the Latin word for "mind" or "intellect." Although Dr. Ware is credited with the idea of Mensa, it was Berrill who actually founded the society on October 1, 1946: he supplied the start-up capital, wrote the first recruting pamphlets, and became Mensa's first Secretary. Berrill after recruiting about 400 people by self-administered IQ tests -- died a few years later. Dr. Ware actually dropped out of Mensa for many years, but later rejoined and remained a member until his death in 2000, with the honorary title Fons et Origo (Source and Origin) reflecting his claim on the original idea. The original ideal was, as it is today, to create a society that is non-political and free from all racial or religious distinctions. Today, Mensa International Limited is the world-wide Mensa organization, based in London, England. American Mensa Limited based in Dallas, TX is where you and I will find the most immediate and relevant information about our own national organization ... about the many activities and benefits it offers ... and about membership.